new greens on the block! Hi! The Sunday farmer’s market is my primary source of greens for green smoothies because of the variety for sale- especially kale in all its shapes and forms. The main organic seller usually has huge bunches of curly and dinosaur kale and different Asian greens so I always go there first before they sell out. So today I walk in the hall and they’re not in the usual spot so I think OK no kale so I walk over to where I always buy my silverbeet, beetroot greens and huge bunches of gorgeous continental parsley. The grower- from Dilliro Vegetables from Thirlmere in NSW- told me he uses garlic spray instead of chemicals to keep the pests off- this is probably why his veges are so tasty! On his table are these huge piles of unfamiliar leafy greens- my greendar is going off with excitement- new greens to find out about and share with you. There are parsnips with the long stems and greens attached, two types of kohlrabi and big huge heads of dark green leafy cabbages. Parsnip greens look like large celery leaves and flat leaf parsley and I think smell like them too. These parsnip greens looked so fresh and smelt wonderful. But…the online jury is still out re parsnip greens toxic/edible etc so I’m still researching this. I am waiting for people to get back to me so will keep you posted. The only green you definitely cannot eat is rhubarb-really toxic and don’t forget rotate your greens and try and use a variety during the week. The actual parsnip part was yummy roasted in olive oil with garlic and cumin seeds then added to my vege pumpkin sweet potato lentil white bean soup. Next to the parsnips are a vege and another green I have never seen before- kohlrabi. Thick green stalks with large flat leaves at the top and a small turnip like base and next to it a purple variety. Kohlrabi is from the brassica family- so super healthy and anti-cancer. The whole kohlrabi plant can be eaten raw (though I used just the leaves in my smoothies) and 1 cup has nearly 5 grams of fibre and is really high in Vitamin C, omega 3 and potassium. The new leafy greens don’t end here…next to the kohlrabi there are big cabbages-but not like the Savoy you see cut and cling wrapped at the supermarket. These babies have dark green outer leaves still attached to a big stalk- I didn’t know cabbage usually came with huge dark green (eg healthy) leaves like this. 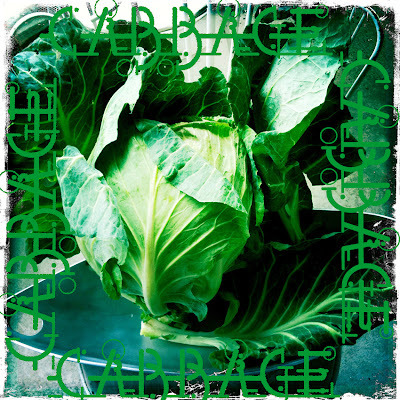 Cabbage is loaded with calcium, iron, iodine, potassium, sulphur and phosphorus and vitamins A, B1, B2, B6, C, E, K and folic acid as well as being a rich source of a number of phytonutrients which block the reaction of cancer-causing substances like lots of leafy greens…this is why green smoothies are SO good- and best of all you are getting all these greens raw. I think I will leave the inner lighter part of the cabbage for other dishes but these outer leaves are going in the green smoothies. This is cabbage straight from the ground and best of all uncut- as soon as it is cut up into wedges it starts to lose nutrients especially vitamin C.
Kohlrabi and cabbage leaves can definitely be used in green smoothies- as usual with a new green add one or two leaves at a time to a milder green like baby or English spinach until you get used to the taste. 3.add 1 large Lebanese cucumber/ 2 tbs ground chia/ handful of koji berries/ kiwi/ frozen banana / cup of frozen blueberries or frozen pineapple- add some stevia to your glass if not sweet enough and too green. I only had one small frozen banana left to add so it needed stevia-enjoy! I am also keen to find out if they are edible. People say no, but have they tried? Celery greens are great in small ammounts in soups etc. V strong flavour, but definately edible. Hi -thanks for your comment. I love celery-so good for you- and always use the leaves in green smoothies. Mixed with other greens because yes they can be bitter. I wondered that too re parsnip greens and thought about trying them in small amounts mixed with other greens. They don’t seem that well known online maybe because you rarely see them for sale. We are really spoilt at the Farmers Markets with our choice of greens. Thankyou for your great feedback! Kohlrabi is a “new” discovery here in the U.S. In Europe it is an old fashion and favorite vegetable. Specially at fall which is the season to harvest this vegetable and it is much cheaper than in the U.S !! The name Kohlrabi is a german word. Original it came from the Latin Word “caulis” . It became in German Kohl which is translated to the english word cabbage . The Latin word “rapa” became the german word “rabi” which means “beet”. In 100g ( appr. 3,5 oz) Kohlrabi are potassium (380mg), Calcium (70mg) and Phosphorus(50mg) magnesium (45mg) and iron (0,9mg) . Vitamin C (65 mg), Vitamin A (Carotin, 0,2 mg), Vitamin B1 (0,05 mg), Vitamin B2 (0,05 mg) und Niacin (1,8 mg) . So enough of the science , I got hungry talking about Kohlrabi. I will go and make myself a salad with Kohlrabi, Apple and Hazelnuts. Hi thank you that was very interesting! I found it wonderful finding all these new vegetables I hadn’t heard of before. The Farmer’s Markets were the best place to do this. Hi. I planted what was labeled as “Kale” last fall. Over the months, I thought they looked different then any variety I had planted before. Turns out this batch was a mixed tray of Kale, Broccoli and yes – Kohlrabi. I was wondering if the leaves at least would be good for my Green Smoothies. This morning on my gathering stroll through the garden, I decided to taste a small bit of a leaf. Well, it tasted pretty good. Kinda like milder collard greens. So I added some to my mix of Kale and Collards. The smoothie tasted wonderful. So farm no adverse effects. Then I come across your site which confirms that the Kohlrabi leaves are not only tasty but very good for us. So glad I had this “accidental” planting! Love your blog and will return for more inspiration.